I think anyone living in Ireland the past few months should get a medal for the winter olympics, between cars sliding down hills, people struggling through feet of snow and then in January all of a sudden the temperatures change by 20 degrees from -10 below to +10 degrees!! Its crazy weather & no wonder so many people have been struck down with bugs & flu. It really is time for hot soups & hearty dinners if not just to cheer you up, but also heat you up. 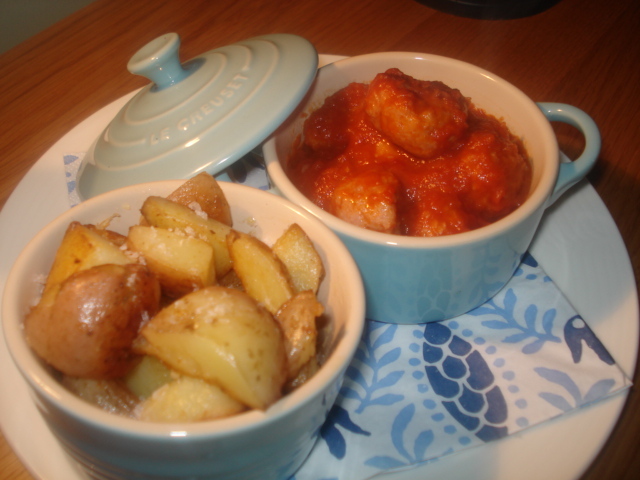 The below recipe is loosely based on the Spanish Patatas Bravas & Meatballs tapas, obviously mine has meatballs in tomato sauce with served with potato wedges!! The Meatballs were formly Clonakilty Ispini sausages which were left over in the fridge! Firstly cut skin of sausages & squeeze out the sausage meat. Then roll into small sausage balls, gently fry in a pan to brown slightly. Next gently fry onion & garlic, then add the tomatoes bring to boil, then turn down to simmer, add the chilli flakes, remove from the pan. Next paprika, also sugar to taste, then add back in the sausage balls & leave to cook for 15-20mins. Serve as tapas or with Potato Wedges.